It's a tiny rock, really ... Angel's Rest. It's no bigger than a compact car. But the view standing on that rock is panoramic. I wish I could share a larger size of the above photo with you. The New River Valley from the Celanese Plant to Pearisburg and beyond is laid out before you like a many-course buffet. (Ahhh ... the buffet ... more on that later). Nearly Sixteen miles of hiking today (8 miles out and back) can be clearly divided into three distinct sections. First comes the 1700 foot ascent in two miles to Angels Rest. Then there are three miles of amazingly flat, level, easy walking along the broad ridge of Pearis Mountain, culminating in good vistas both east and west from a Power Line clearing. Here's a telephoto shot looking west into West Virginia. 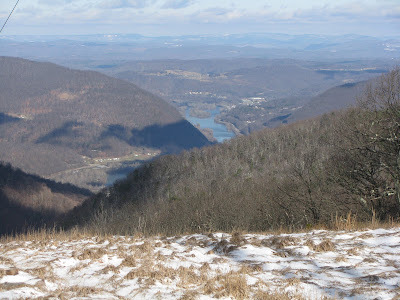 The New River is visible here as it passes into the Mountain State just beyond the town of Narrows. 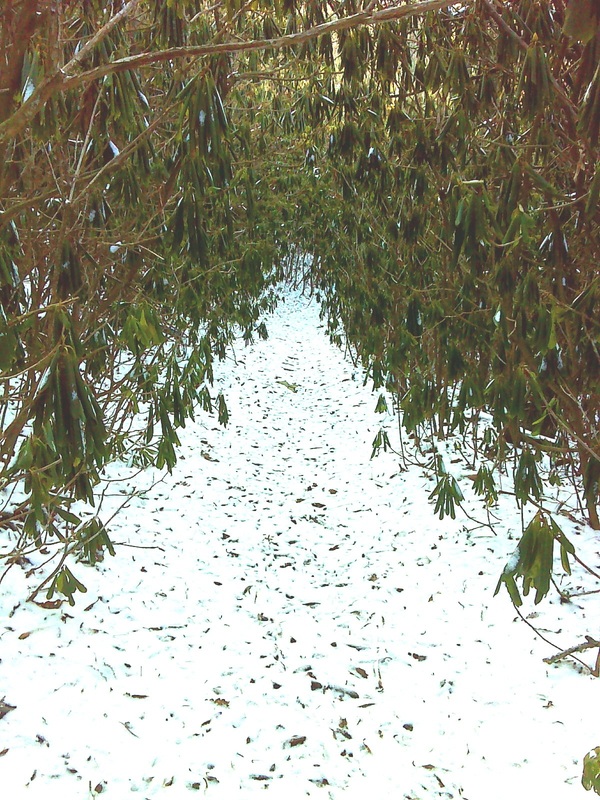 And then, finally, there's "Rhodo-road" - an amazing three mile stretch of old road bed that leads you almost continuously through a tunnel of Rhododendron. 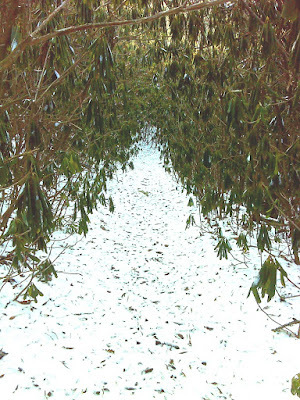 Because of the frigid weather, the Rhododendron leaves have gone into their unique adaptive strategy to avoid dessication: their leaves curl up and droop to avoid being freeze-dried by the sun. They stay that way because when it's below freezing their stems can't re-supply the leaves with water. At the end of the 8 mile hike was Doc's Knob shelter, a convenient turn-around spot for a hike of ideal length. Back to civilization I had time to scope out tomorrow's trail access parking area and starting point and then headed back to Pearisburg to the "Lucky Star" Chinese Buffet - High quality food compared with many of these ubiquitous Chinese buffets that haunt my past. Their sushi was limited to four types, but was well made, perfectly fresh, and delicious. I found myself with two other cravings: I went back half a dozen times for Lo-mein noodles - mmmmmmmmmmm, carbs. And, of course, I had three servings of ice cream! Late breaking news, though ... I may not make it back to the mountain ridge parking area at Sugar Run Gap as planned tomorrow morning because it's snowing and the roads look treacherous. Hunkered down in Pearisburg for now. Stay tuned. Here's the GPS track of today's hike with ten photos embedded along it (located at the red 'pins'). There's also an option to look at the travel speed and elevation profile.